Welcome to Phong Nha! We hope you love this village as much as we do. As you’re passing through, you might be a little bit unsure of the norms around here, but luckily, your local travel specialists are here to assist you with that. Below we’ve listed some important things to know to help you make your way around our little town. There are two ATMs in town, run by Sacombank, located across from the Phong Nha-Ke Bang Tourism Center. Please be advised that the ATM does not work during power outages (not uncommon in Phong Nha), and there are times when it simply isn’t working. Come prepared to Phong Nha with some Vietnamese dong already in hand. Credit cards aren’t widely accepted in Phong Nha, but they can usually be used at major hotels upon checkout (Farmstay, Lakehouse, Easy Tiger, etc). Please expect to pay in cash at all restaurants, shops, and in the local market. The exchange rate is about 22,000 VND / 1 USD and subject to change. Expect anywhere that changes currency (such as Easy Tiger Hostel) to give you an exchange rate of 20,000 VND / 1 USD. There are many sweet children around Phong Nha. Please say hello to them! Most young people want to practice their English around here so if you can spare the time, please speak a few words with anyone attempting their English with you. Most children can (at the least) say hello, as well as ask your name and how you are. They’ll also want to know where you’re from! We’d love if you wouldn’t mind stopping to chat with the children for a moment; we promise you won’t regret it, and it helps to increase good will between foreigners and locals. However, please refrain from giving them money or even sweets as we don’t want to encourage begging for these things. While most people in town dress very casually, please realize that prior to a few years ago, there were no foreigners/westerners in town at all (other than our resident caving experts Howard and Deb). Please be respectful of the fact that many villagers are still new to foreigners and their customs / way of dress, and dress appropriately. When walking on the streets or visiting shops, restaurants, etc, please make sure you have a shirt on, and that you aren’t wearing anything too revealing or flashy. Outside of a cave tour, Nuoc Mooc Eco Springs, bathing suits are not appropriate attire around the village and some locals will be offended if you choose to wear this outside of your accommodations – and yes, you will get many stares. Choose your outfits accordingly if you have a more casual sense of style. It is not advisable to drink tap water in Phong Nha. Along with the common risks of drinking tap water in a third world country, tap water in Phong Nha contains high amounts of limestone, calcium, and other minerals. Please drink bottled water. Flooding season usually starts around mid-September and runs until mid-November every year. The flooding is not continuous; it rises and recedes with the heavy rains. Floodwaters remain stay high for up to a week at a time. 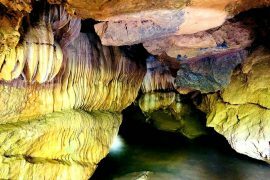 Please check the weather forecast in advance prior to traveling to Phong Nha at this time if you are interested in seeing Paradise Cave or Phong Nha. Please note that transportation is extremely hard to arrange around major holidays, especially Tet. You must arrange up to one month in advance or you will be paying premium prices for private transfers or possibly end up stuck in town if you don’t have transport arranged. There are few services open around town during Tet Holiday but it can be an amazing experience if you are lucky enough to be invited into the home of a local family. Do yourself a favor and pop into the ever-popular Easy Tiger, where you can pick up a decent map of the area. Their friendly staff will be happy to point out to you popular places to eat, where to rent motorbikes (see more below on motorbikes), and can explain to you more about the must-sees of the area. The market in Phong Nha is located along the main road, just between the Best BBQ Pork & Noodle Shop in the World and the Phong Nha Tourism Center. The market can seem a little chaotic but it’s worth checking out, especially if there’s anything you need. Bring small bills with you, and don’t expect anyone to speak English. Everyone in the market is very friendly, but you can expect stares if you are a foreigner. Unfortunately you can also expect that in some places you will receive a “foreigner price”. Feel free to bargain in the market, and enjoy winding your way through the back of the market where the freshest fruits and veggies lie. The market is best visited around 6 – 9 AM. It is open until about 11 AM, and then closes for a few hours until the afternoon. It opens again around 2 PM and goes until about 6 PM (hours vary at different times of year and at shop vendors’ discretion). You will be able to find basic things such as hats, socks, flip-flops, raincoat, snacks, etc but not proper trekking clothes. Only very basic medical care is available in Phong Nha, mostly for common ailments. There is a small medical clinic located near the entrance to town (no English spoken at the clinic). If you are in need of more serious medical care, you will need to move to Dong Hoi Cuba Hospital (1 hour transfer) or even Hue International Hospital (4 hour transfer). Due to the high risks of riding a motorbike, we do not recommend hiring a motorbike to ride while you are here unless you are an extremely experienced rider. The Phong Nha Ke Bang National Park is NOT the place to learn how to ride a motorbike. It’s best to head into the national park via the Ho Chi Minh east highway. Do not ride motorbikes to the national park after sunset as there are no lights on the roads and it can be very dangerous. There are also some locals who ride at night with no lights on and you could encounter them suddenly on the road with no warning. If it is getting late in the day and you’d still like to explore, we recommend not going any further than the Botanical Gardens. Please always wear a helmet while driving or riding a motorbike. The most common form of taxi is a “xe ôm”, or motorbike taxi. Most hotels and hostels know the number of a “xe ôm” driver if you are in need of a local taxi. Most drivers do not speak English. Karaoke is a local favorite in Phong Nha! Be sure to check out one of the several karaoke shops that line the main road. Expect to pay about 80,000 VND ($4 USD) per hour (excluding drinks). There is a main pharmacy located at the front of the market, just off to the left. They are open from 7:00 AM – 7:00 PM and sell basic medicie for flu, headache, stomachache, iodine, but very little for urgent or serious medical care. Power outages are common in Phong Nha town, and often unpredictable. Most large hotels will run a generator in case of power outages but don’t expect smaller local hotels to do the same. Power outages can last up to 12 hours and happen often in the summer and especially in the flooding season, when power can be off for several days at a time. 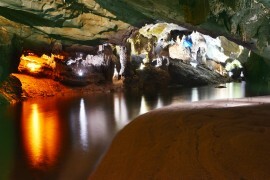 Phong Nha is relatively safe to walk around, even in the evening. Muggings are quite unheard of, however this is still a poor village and there’s always a chance of a bad apple in any town, so please follow the regular common sense rules: walk in well-lit areas, don’t flash your valuables around, be appropriately dressed, and know your way back to your accommodations from wherever you are. Swimming in the river is an amazing experience, especially on a hot summer day. The river is clean and refreshing. You might get strange looks from the locals but don’t let this stop you! The river is a beautiful place to go for a dip in the morning, or to relax in the evening during sunset. There are many beautiful cows and muddy water buffaloes wandering the streets of Phong Nha. While you are welcome to take photos of them, please do not try to pet or ride them, as this will scare them, and be an uncomfortable experience for both you and them. And if you have any specific questions regarding local customs prior to a trip to Phong Nha, you can always contact our friendly local travel specialists who would be happy to help answer your questions or ease your concerns.